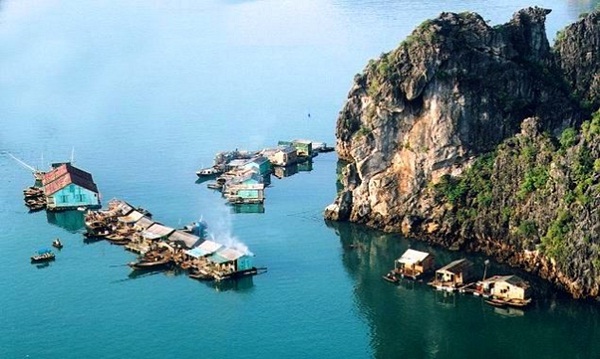 Cua Van, whose floating houses look spacious and clean, is regarded as the “wealthiest” village in Halong Bay. The affluent families even have attached houses’ roofs with radios, small television sets, simple chair and tables, etc. Paying a visit to the village, travelers have a great opportunity to experience the daily activities of the fishermen as well as know more about the traditional culture and customs of the villagers. It is an informative lesson for kids and a unique experience for adults from other cultural backgrounds when observing the process of making of fish nets and fishing. Situated far away from the popular destinations of Cat Ba Island, where there are about 50 families with a population of 300 residents stay is exactly an ideal place to have relaxing time and immerse in the laid-back atmosphere. 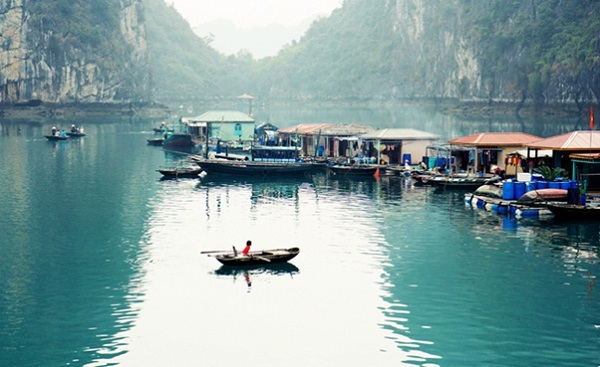 Out of the four lovely fishing villages in Halong Bay, Vong Vieng is the less known among the travelers but a suitable place for those are seeking to experience the fishermen daily life. The village offers travelers a great opportunity to experience the daily activities of the fishermen as well as know more about the traditional culture and customs of the families of fishermen, who have lived here for generations. 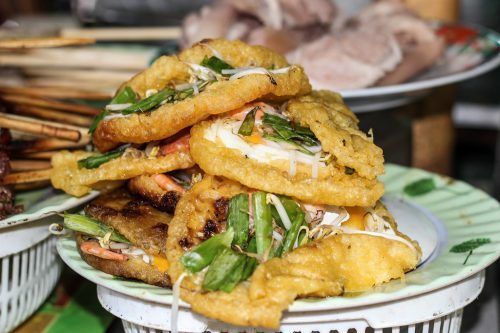 Staying far away from the busy tourist destinations, the people at Vong Vieng is hospitable and friendly to all kinds of curious travelers. It is unforgettable memory to participate in the process of making of fishing nets and observing the cantankerous children, who account for one third of the local population living up the tranquil fishing life. Once setting your pace on the peaceful village of Vong Vieng, don’t forget to stay overnight to experience the exciting communal activities which are only available in the evening. Under the spectacular moonlight, you will sit on woven bamboo boats next to the crackle fire, enjoy fresh and cool air, watch the interesting folk song performances, drop flower coronals and colorful lanterns for luck as well as witness the fishermen catching marine products. 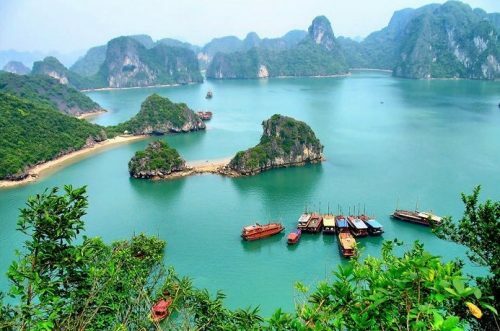 When referring to Halong Bay, the image that always appears on people’s minds is the incredibly magnificent mountains rising from the turquoise green water. 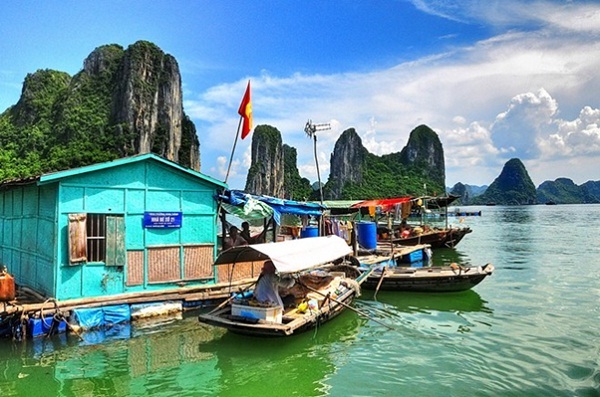 However, Halong Bay offers you not only first-class caves and grottos but also fresh air, peaceful atmosphere and stunning sceneries of the colorful fishing villages including Cua Van and Vong Vieng fishing villages.